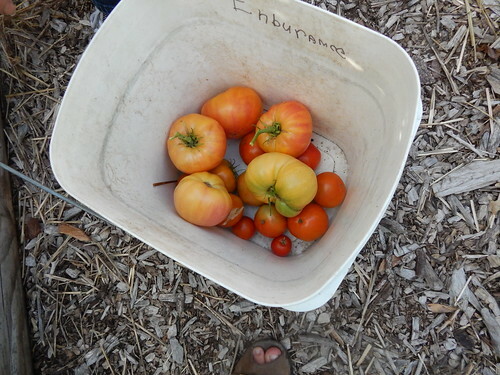 We had lots of things to pick today after a hot weekend! We also planted a lot of things for fall, with more to come in the upcoming weeks. Some normal cucumbers, for a change! 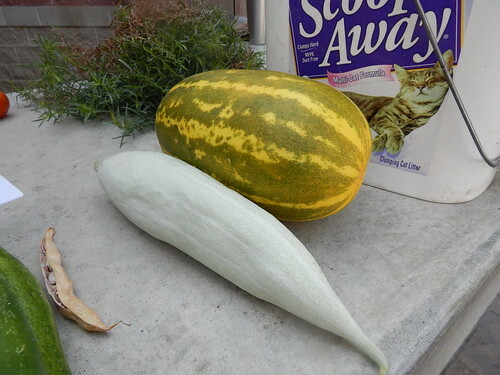 A Snake Gourde and a Sambar Cucumber from the Taste of India Garden. No, that bucket doesn’t have kitty litter in it. And in the lower left corner is a pod of the Lingua di Fuoco beans from the Italian garden that I picked to show that they aren’t quite dry yet. Some pretty heirloom tomatoes! Most of these are Northern Lights with a few cherry tomatoes and Silvery Fir Tree tomatoes. 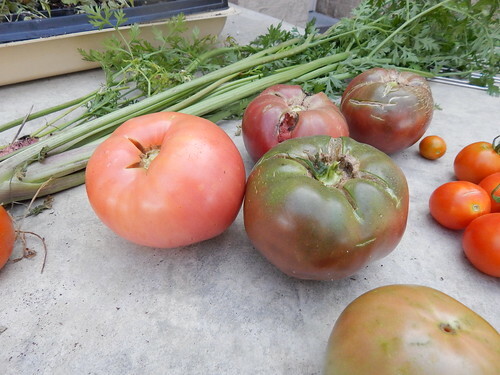 Some n0t-quite-so-pretty heirlooms. Okay, the pink one isn’t bad. But the three Black Crim are all cracked and the one has been recently chewed on by a caterpillar. Ugh. Yes, those are carrot tops by the tomatoes. No, I didn’t take a picture of the carrots. I pulled a couple of the ‘Kesar’ red carrots from the India garden because the tops were so tall and I thought I’d check them out. The roots look pretty small yet, so I don’t know if it’s the heat and time of year, the variety, or if it just needs to keep growing. 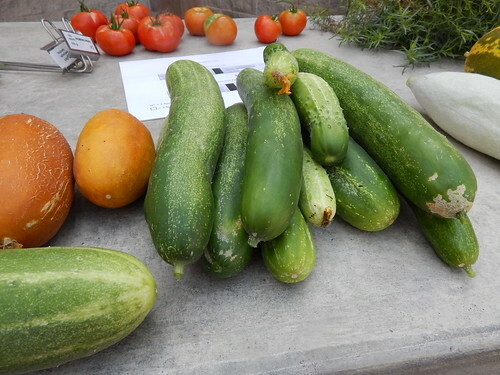 Posted on July 29, 2014, in Harvesting & Eating and tagged cucumbers, Tomatoes. Bookmark the permalink. Leave a comment.